Risk management is often scary but always critical. Trust author Linda Graff to guide you step-by-step to management volunteer involvement with safety and awareness. "Life is full of risks." This is how Linda opens Better Safe, in which she urges us to become conscious about risk management in our organizational lives. For over a decade, Linda has led workshops and written countless articles about risk management. Finally she has produced an essential source book for managers of volunteer and community service programs everywhere. 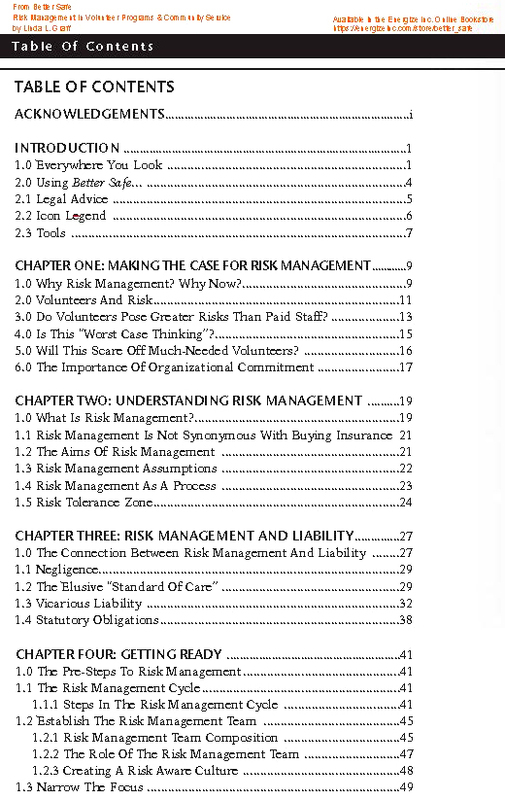 Better Safe first gives a broad overview of all the components of good risk management, including information on negligence, the elusive "standard of care," vicarious liability, and statutory obligations. Then, the book provides all the tools required to systematically examine and plan improvement of current practices -- tips, checklists, sample forms, and hundreds of time-saving, common sense, affordable strategies. The book shares real-life case study examples and covers many of the special situations unique to volunteer involvement. There are diagnostic worksheets (in plain language), including a risk identification and impact matrix, a likelihood of occurrence rating scale, a magnitude of harm matrix, and a risk control planning worksheet. Do Volunteers Pose Greater Risks Than Paid Staff? Do volunteers pose a greater threat of injury or liability to organizations than paid staff? The answer may be both no and yes. Experience proves that in the overwhelming majority of cases, volunteers perform their work to the highest standard. Most are dedicated, committed, conscientious, and trustworthy. Most nonprofit organizations could not survive, let alone thrive, without them. The Alliance for Nonprofit Management, an association which promotes improved management and governance of nonprofits, reports that while volunteers can suffer injuries while engaged in volunteering, anecdotal evidence suggests that volunteer injuries are infrequent and minor, and volunteers do not appear to get hurt any more frequently or severely than paid staff. (The Alliance for Nonprofit Management, 2001b: 1). However, because so many nonprofit organizations involve many more volunteers than paid staff, sheer numbers of volunteers in action will most certainly increase the odds that something will go wrong somewhere. Remember also, that injuries to persons and objects are not the only perils to contend with in volunteer and community service programs. Volunteers have the potential to damage an organization's reputation which, for a nonprofit, can mean the loss of a most valuable asset -- public trust. Most organizations are aware that misdeeds by their paid staff can reflect badly on the organization to ruinous effects. Unfortunately, nonprofits are less aware of the devastation that can flow from the misdeeds of their volunteers. The "they're just volunteers" attitude serves to mask the real risks that a well-intended but inappropriately placed volunteer can pose to even the best, well-respected, and otherwise well-managed nonprofit organization. Hence, volunteers may expose organizations to liability because there are so many of them and because they tend to be overlooked. The executive director instructed the manager of volunteers to eliminate performance evaluations for volunteers because he thought it was insulting to question the ability of people who were "volunteering" their time. These volunteers are in an advocacy (guardian ad litem) position for older persons in nursing homes. Theirs is very responsible work which demands special skills, and just the right mix of diplomacy and tenacity. Now, no one checks to see if they are doing their work well. Linda Graff takes the fear out of the words... Her worksheets and notes will help agencies of every size develop a plan... With this guide you will learn how to appraise, acknowledge, address and avert risky situations. Many of my colleagues know my long-standing aversion to developing policy, but Linda has certainly won me over with her writing. Better Safe... makes the philosophical and practical case for risk management. I highly recommend it to all organizations that involve volunteers in meaningful ways. Better Safe… is an outstanding book that is coming at the right time! Linda has done another superb job of supporting the necessity for a strong risk management plan... This book has some of the most useful tools, resources and suggestions that will certainly be of great value for all involved in volunteer management and the implementation of community service programs, regardless of the structure of the organization or clientele being served.